hey dear, i love your margot bag so much. totally my taste! and btw: this pants are wonderful! i like them so much on you. you look so pretty! Love the soft leather trench coat; was rather disheartened when I saw it was Vintage and I couldnt get my hands on one! Beautiful as ever Veronica! Love it!This trench coat is great! What an impeccable look! I love it! I like the contrast you made in your outfit! Lovely coat, you look fantastic. Kisses. Hey Veronica! Thanks for stopping by to see me :) ADORE adore adore your leather trench! Beautiful, classy, and a bit retro. I guess floral pattern, wide leg denim and a braid gives this 70-ies nostalgic flare. I absolutely love this look. Your blog is so great, I’m a new follower! Also, thanks for stopping by my blog, I greatly appreciate it. I love the combination dark blue and brown! Oh honey, that jacket is a dream! Love the waist cinch action…so demure and downright dangerous! Flawless look! I prefer the raincoat for a rainy day, just because it rains a lot here in Portugal during the winter!! But you look fantastic, the coat has a sweet color!! This leather piece is an eternal beauty!!! U styled it excellent, the bag is perfect, not to mention amazing flared jeans!! Amazing coat! You look so cool! Beautiful rainy day attire. Love the peek of the ditsy floral print. Adds such a sweet touch. 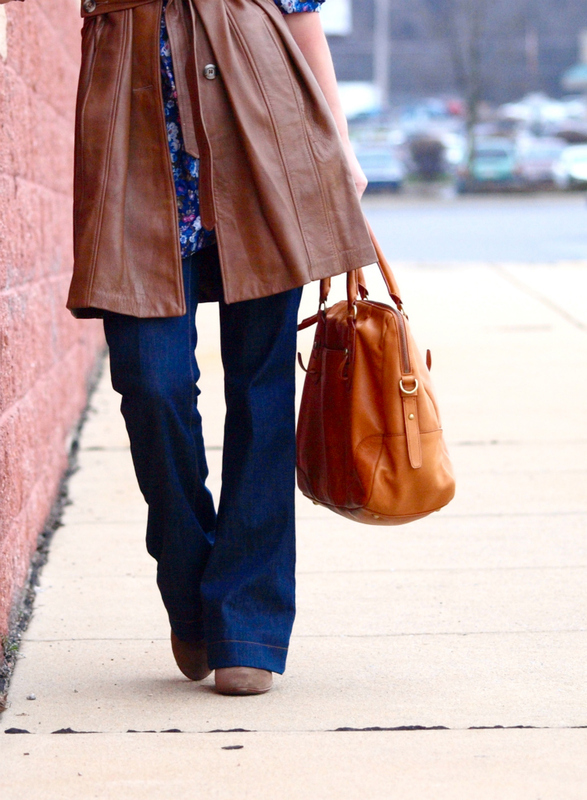 Love this buttery soft leather trench on you, striking hun! I just love the delicate florals peeping out behind the tough leather! Wow! Love this look! The jacket is beautiful, the pants are retro and chic, the shoes are unreal! Love it! sweetie you look great so classy!! This reminds me of the 60’s, love it! That jacket is so amazing, great look :). Those are Levi’s? They are fabulous! I love that leather coat! 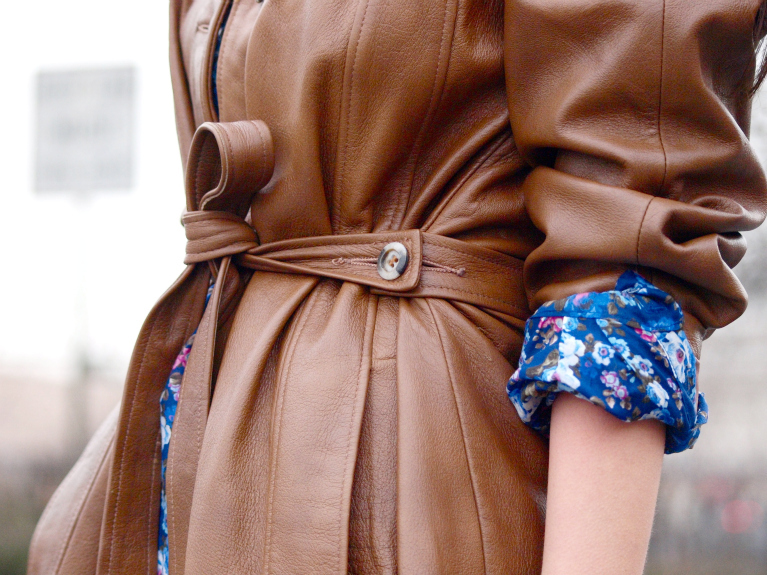 The leather coat is pure class, and the floral top complements it perfectly! That is one cool and gorgeous leather jacket – I love it with the sleeves rolled up! Really love the 70’s chic feel to these photos. If you ever get sick of that amazing coat please send it my way! You never cease to amaze me..great outfit again. just figured out to follow you! keep in touch alwys babe..
You look stunning! Love the leather. Love this look! Tres retro! I love all the pieces! Beautiful look is perfect style seventies.. Very beautiful colour combination :) and I adore your leather trench coat! Wow that keather coat is fabulous! I love it sooo much! And ii love the whole outfit! This is an impeccable look. I love everything about your outfit. Your coat is so pretty. Great color. Such a great combination! Love your hair braid! Perfecta combinación de colores, estas guapisima! an awesome outfit! LOVE the coat! I really like your blog! gonna follow you! this is all so stunning! I love the florals paired with something a little bit more rough. The perfect combination! I love the way you balance masculine and feminine elements in this outfit… absolutely impeccable! I love the diff shades of brown..nice jacket & bags! gorgeous look, I LOVE your bag! I’ll stop commenting on all of your old posts after this…that outfit is by far my favorite. I love the colors, the patterns, the vibes…it’s fantastic. It feels slightly vintage, but still comfy and classy.